The rise of electric bikes in China necessitates infrastructure and policy shifts to ensure safety for all road users. Photo by Maciej Hrynczyszyn/Flickr. This article is one in our series of China Transportation Briefings. The series – exclusive to TheCityFix – shares interesting news and noteworthy research related to China’s transportation and urban development. The goal is to help people who are interested in solving China’s urbanization and transportation problems understand relevant Chinese policies and trends. Electric bicycles – or “e-bikes” – of all speeds and sizes have become increasingly popular in Chinese cities. With motorcycles banned in many cities, China has quietly replaced the once-popular two-wheelers with e-bikes in most cities beginning in the late 1990s. Today, there are an estimated 200 to 240 million e-bikes in China, although half of them are unregistered. The annual increase in e-bikes is as high as 12 million, according to some estimates. The popularity of the e-bikes stems from their ability to provide relatively cheap personal mobility to users of all ages and genders, but they have one major drawback: safety. Both the importance of e-bikes in providing personal mobility and the problems they pose are often neglected by policy makers. A study of Chengdu and Shanghai showed that e-bikes are used by all ages and both genders, primarily for daily commuting. The majority of e-bike users are of medium-level income, and most trips are less than 40 minutes in duration and shorter than ten kilometers in distance. 50% of e-bike users relied on buses before switching to e-bikes, while 18%, 10%, 7% and 7% originally biked, walked, used metro, or took taxis. E-bikes, then, can contribute to sustainable urban mobility in that they can help shift populations who might have switched to cars to use a mix of e-bike and mass transport as they move up the income ladder. However, with the growing population of e-bikes has come an alarming increase in traffic crashes and fatalities. In Hangzhou, the share of e-bike related road fatalities has increased from under 2% in 2004 to over 23% in 2010, despite a decline in overall traffic fatalities. In Kunming and Ningbo, e-bikes are involved in over 30% of total crashes, but are used by only 10 – 15% of residents. There is no single reason why e-bikes raise such significant safety concerns, but there are some trends consistent across Chinese cities. First, e-bikes are considered non-motorized transport – just like a regular bicycle – with no dedicated infrastructure. As a result, e-bike users share lanes with cyclists and sometimes pedestrians. In theory, e-bike users can only travel at a maximum speed of 15 km/hour (9 mph). However, the reality is that e-bikes are often able to travel faster than 20 km/hour (12 mph) due to lack of enforcement. This speed might make e-bikes attractive users, but greatly increases the risk of injury in the event of a crash, not just for the e-biker, but for pedestrians and cyclists, as well. To try to avoid crashes with pedestrians and cyclists, some e-bike users intrude into the motorized traffic lanes, but as expected, they fare no better there, leading to even more catastrophic injuries. Source: Beijing Municipal Commission of Urban Transportation 2011. Graph by EMBARQ. There are several small steps that cities can take to make e-bike riding safer for all. 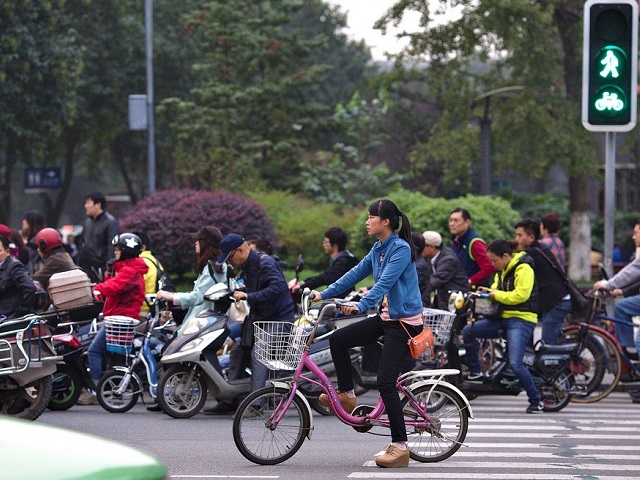 A study in Chengdu revealed that less than 20% of e-bike users understood the traffic speed limit, while another study of 603 e-bikers in Beijing and Hangzhou showed the correlation between automobile driving experiences and at-fault accidents, as car drivers possess better awareness of traffic regulations. Education on traffic rules is a key component in creating safer roads. Aggressive driving behaviors, such as violating traffic signals, driving against the flow of traffic, and driving in the automobile lanes are the chief contributors to e-bike crashes. In addition, poor enforcement of helmet regulations are also a reason for high fatality rates. In Hangzhou and Beijing, concussions constitute over 60% of e-bike related injuries. Simply enforcing helmet wearing could reduce fatalities and injuries while cities work on longer-term strategies to improve expand safe infrastructure for non-motorized transport and pedestrians. While e-bikes have enormous capability to increase personal mobility, lack of government attention to the safety issues surrounding e-bikes is jeopardizing their potential as a safe and sustainable transport solution. Special e-bike-focused policies – such as enforcing e-bike registration, increasing industrial standards, creating dedicated e-bike infrastructure, raising awareness about safety concerns, and enforcing traffic regulations – can chip away at the rising tide of e-bike related injuries and deaths. In a positive move, Beijing is beginning to develop safety procedures, but this is unique among Chinese cities. E-bikes, the numbers suggest, are here to stay, so city leaders must use their rise to create safer, more sustainable cities.